Tony Rauch, Laredo. Eraserhead Press, 2008. Pp. 201. ISBN 1-933929-72-3. $10.95. A lot of fiction is described, with varying degrees of accuracy, as dreamlike. In this case, however, dreamlike is a very accurate description indeed. Laredo is a bizarre, surreal but often highly funny and entertaining work. There is seldom any sense or logic, sometimes no coherence, yet as I set off on this odd, odd journey, I found the writing was so utterly compelling I simply had to know what the next story was going to show me. What are these stories about? Does it matter? They are random, splintered fragments of... well, it’s hard to say really. Sometimes Rauch’s stories follow a narrative stream and some seem to be stream of consciousness torrents of imagery and thought. The opening story is a funny, philosophical discussion between a man and his ex-girlfriend. The problem is that the ex-girlfriend has shrunk to the size of an ant and discovered that far from being a terrifying experience it is actually quite enlightening and comfortable. ‘Once I saw a pretty girl’ draws us back into a semblance of the real world of urine stinking bus stations and infatuation. In ‘Saturday Splendour’ the narrator goes on an insane high speed ride with his brother-in-law. ‘The strange green moss of my discontent’ begins with the discovery of a weird growth on the living room walls and quickly spirals into Rauch-ian madness. ‘Analonia’ has a Kafka-esque metamorphosis that involves extra eyes and mouths. In ‘Happy’ a young man discovers that his father has turned into a fish, and there is a possibility that ‘The President may be shrinking’. And so it goes on, bizarre conversations, trains of events that are described with gleeful breathlessness. There are crashes, apocalyptic and intricately choreographed fights and domino-like disasters and that build to impossible and catastrophic climaxes. Then there are the lists, fascinating, intense, astounding lists. Tony Rauch writes in a straightforward, simple very clear style. His American rhythms and slang enhance the story telling. The cover illustrations and occasional illustrations look to be stills from a Land of the Giants style film or television series, featuring a group of mouse-sized humans attempting to bring mischief to us normal sized mortals. Other pictures, such what looks like a wrestling class, have a surreal quality enhanced by the fact that although they were originally devoid of any irony but now seem utterly bizarre. The publisher, Eraserhead Press, deals exclusively with absurdist fiction and it is good to see this area of literature embraced, encouraged, packaged and delivered to a world cursed with literary blandness. So, did I enjoy Laredo? Because of the review requirement to read the book from cover to cover, the strange procession of oddities, nonsense, absurdity and surrealism became somewhat overwhelming and meant that after a while, I could not enjoy each story on its own merit. So a word of advice, dip in and out, work your way through slowly, sporadically and that way you can appreciate each tale of what it is. For me there is a lack of emotional engagement in many of the stories. This is not down to bad writing because there is no bad writing here, it is, rather, the nature of these tales, the odd world of the dream where people are suddenly rowing boats through the sky, or clowns and other circus acts are waging war in the street, make it difficult to really get under the skin of Rauch’s characters. It was something that I came to miss as I spent more and more time with the book. 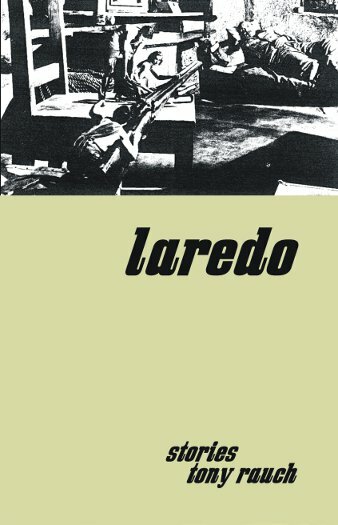 So, don’t approach Laredo looking for an intense emotional rollercoaster, board it looking for a wild ride through the world of the dream, a world in which logic plays little part and the unexpected is part of the fabric of its universe.